So, you are married now, congratulations! You’re about to experience a wonderful ride. If you are like most people, you probably have some student loan debt that you are holding onto and now that you are married, it may have doubled. Since you both share debt now, you may want to think about paying it off at the same time together to ensure both you and your partner are working towards a better financial future. 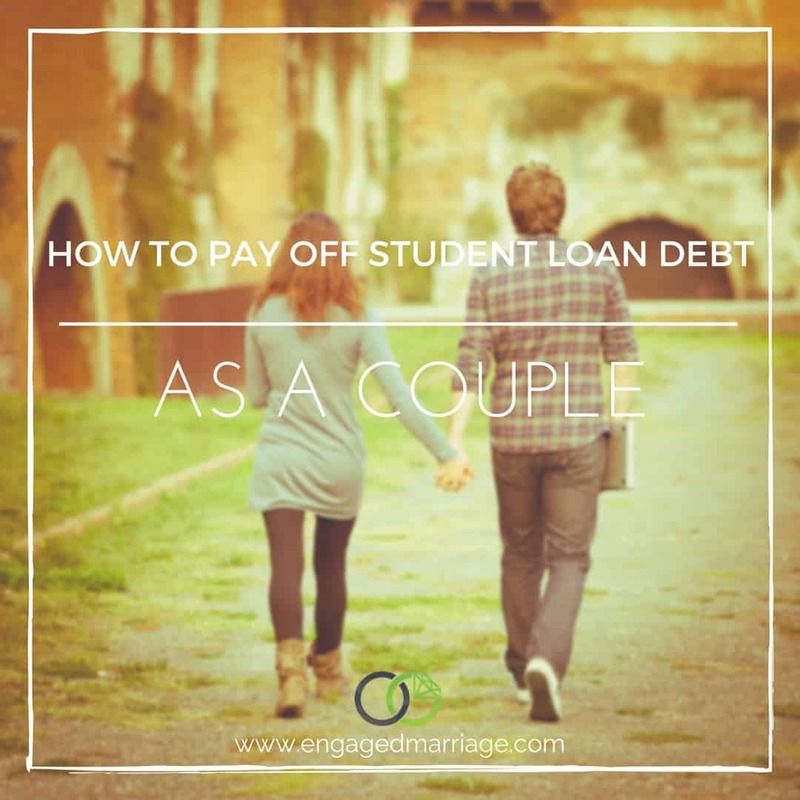 Below, we will explore some ways that you and your partner can team up and work together to pay off student loan debt as a couple. When you get married, you may automatically think that yours and your spouse’s debt instantly merge together. They do not. When we mention that the amount may have doubled, we are saying that if you had $10,000 in debt and your partner had $10,000 in debt, you collectively have $20,000 in debt. If that is the case, you should look into consolidation if you want to put a ring on your debt. But, there are limitations to this. If you are your partner have student loans (federal or private), it is important to know that you CANNOT merge your loans together and consolidate them with a federal consolidation loan. Federal consolidation is offered to individuals only, so you cannot lump them together through the government. There is a solution though. You and your spouse can consolidate your loans through a private lender which is more commonly known as student loan refinancing. There are many lenders out there who will consolidate your loans, so you and your partner can work on paying the debt down. Consolidating your student loans is a good idea if you have big plans in the future such as buying a home, a car, or even starting a family. Here is more on private student loan refinancing and its differences with federal consolidation. Since federal consolidation is a bit different than refinancing your student loans through a private lender, so you must explore both options thoroughly to see which one will work for you. Refinancing your student loans with your spouse may be a good idea and can help save the both of you thousands of dollars. Refinancing works to reduce the interest rate that you pay on your student loans. When you head to a private lender, they will take all of your student loans and combine them into one loan. From there, a repayment term, monthly amount, and interest rate will be generated. Many people choose to refinance their student loans because you can get a rate that is substantially lower than that of which you pay now. For example, many borrowers, who qualify, receive an interest rate somewhere at 3% to 5%. Before you choose to consolidate or refinance your student loans with your spouse, you want to make sure it is the right idea. You should think about whether or not you are ready to give up the benefits that come with the Federal Direct Loan program. When you refinance or consolidate through a private lender, you will no longer have the option for deferment of the loan, forbearance, or convenient payment amounts. This is something that needs to be discussed upfront, so that you can make sure it is within your budget. In addition, you and your spouse need to be on the same page as to whether or not you both want to combine the loans and make payments together. Some couples determine that this is not the best option for them and it may or may not be the choice for you. Lastly, take some time to think about how much the payments will be, how they will be made, and what your goals are. For example, if your total monthly payment combined is $350, who will make the payment? Do you switch month to month, do you split the amount in half every month, or does someone take on the whole amount and the other pick up another bill in a similar amount? The choice is up to you, but you should have a plan in place to prevent default or late payments. You may be making a wise choice by paying down your student loan debt as a couple. You can save a lot of money in interest if you choose to consolidate or refinance. With that said, you do need to make sure it is the right financial move for the BOTH of you before you sign any new paperwork.